The list of Ho Chi Minh City’s tourism features welcomed Tuesday a ‘specialty’: seven river tours that will take tourists around the city via its diverse system of canals and rivers. The tours depart daily from the Bach Dang port, according to its operator, Saigontourist. From there, tourists can choose to travel to seven destinations, including Dong Tay Highway, Binh Quoi, the Cu Chi Tunnels, Can Gio, Vam Sat Tourism Center, Long Phuoc orchard in District 9, and Phu My Hung in District 7. Tickets range from VND295,000 to VND1.68 million per passenger. Tourists will travel by the company’s fleet of 10 high-speed motorboats which are capable of holding six to 40 passengers each. The tours last from 30 minutes to five hours, depending on the destination. The river tours were implemented under a bid by the city People’s Committee to diversify local tourism products and attract more visitors. The city has called on localities along the riverside and other economic sectors to take part in what is considered the city’s top priority to boost tourism in 2013. 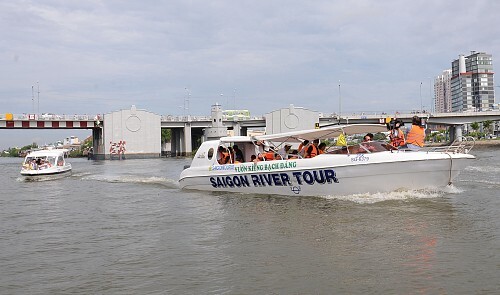 “Economic sectors are encouraged to help develop river tourism,” Nguyen Thi Hong, deputy chairwoman of the city People’s Committee said at the ceremony to unveil the river tours on Tuesday.